Russia's US ambassador Antonov said that it would be "naive to believe that the problems, which have been accumulating for years, can be solved in an instant"
WASHINGTON, September 14. /TASS/. 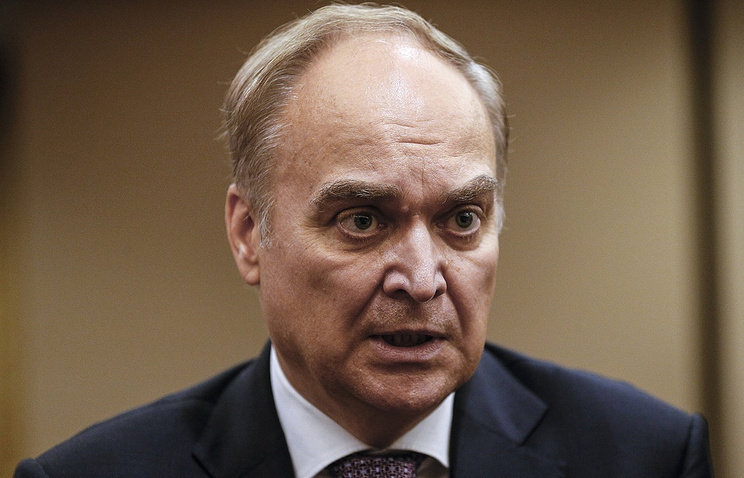 The domestic political situation in the United States hinders the process of transforming the positive tone of the Russian-US Helsinki summit into practical solutions, Russia’s US ambassador, Anatoly Antonov, told reporters on Thursday. "We expect that the positive tone [expressed] at the highest level would eventually be reflected in the practical dimension. However, the process is now being impeded by the complicated internal political situation and the ongoing demonization of Russia on the Capitol Hill and in the US media," he said. "The talks in Helsinki were important not only from the point of view of bilateral issues, but for international security as well," the diplomat continued. "They reflected the intention of the presidents [Vladimir Putin and Donald Trump] to prevent further deterioration of relations and to outline steps for overcoming the crisis in them." However, Antonov said that it would be "naive to believe that the problems, which have been accumulating for years, can be solved in an instant." "Nobody expected that. Nevertheless, at their joint press conference to sum up the results of the Helsinki summit, President Vladimir Putin has made a series of serious proposals to President Donald Trump regarding strategic stability and non-proliferation of weapons of mass destruction, on continuing the cooperation in anti-terrorism and cybersecurity," he went on. "The Russian president spoke in favor of our countries’ leading role in organizing cooperation to overcome the humanitarian crisis in Syria, in helping the refugees to return to their homes," the ambassador added. "There were other ideas as well, including economic cooperation, contacts between people." The ambassador said Russian-US relations, which currently are at their lowest, are becoming further strained by the political struggle in the run-up to US midterm elections. "The issue of attitude toward Russia has being used by Washington politicians in their political struggle," he said, adding that this trend "has particularly intensified lately, in the run-up to the midterm elections to the US Congress." "It’s like table tennis - the sides attack each other with Russophobic accusations. This would not benefit the interests of Russia and the United States," the Russian diplomat continued. He said that both countries "cannot afford to let mutual accusations undermine our capacity of efficiently responding to major security challenges." "The relations have plunged to unprecedented low. We view this as an anomaly, which runs counter not only to the two countries’ national interests, but to the interests of the whole world. We, on our part, have never been short of proposals about what steps can be made and what issues can create the uniting agenda. We assume that there is the need to steadily and consistently promote minor projects, which would have positive influence on bilateral ties, and to embark on more ambitious tasks later on," Antonov said.